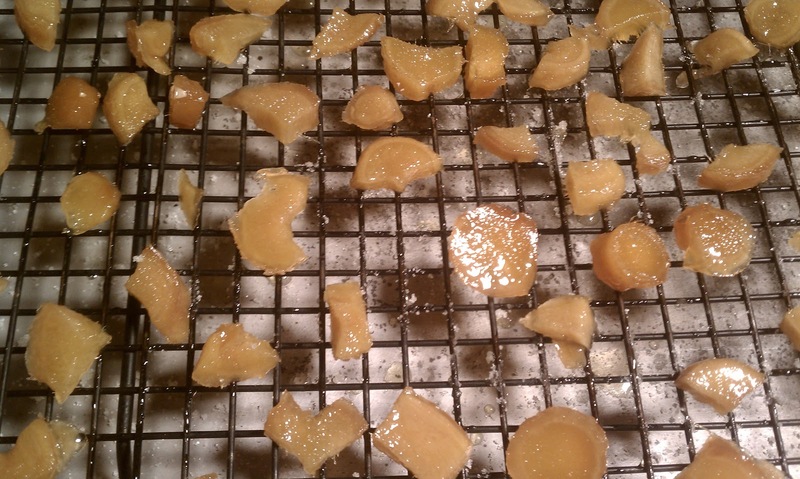 Have you ever tried candied ginger? No? Neither had I. Well, I have used it in turkey brine, because that's what Alton Brown says to do. But I have no idea how 1 1/2 teaspoons of candied ginger really affects the flavor of a 14 lb turkey. 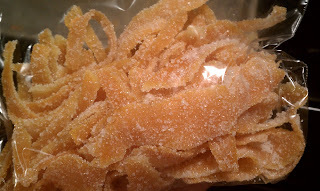 I have been trying to remember if I have ever used my stash of candied ginger for anything else. I have a vague memory of doing so, though I can't remember what the recipe was. Never the less, I decided that this year is going to be different. Honestly, I have learned to love ginger root this past year. I have decided that I love Thai food. Not so much the coconut side of things. But the garlic, ginger, cilantro, lime, peanut, sweet, salty, sour, bitter complexity of Thai food is interesting to attempt to cook and delicious to eat. 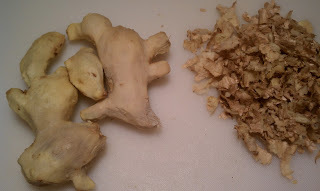 And at the top of the list of ingredients in the best Thai food I have ever eaten or attempted to cook, is ginger. Oh, the ginger rice soup at Thai Palace restaurant in Holland is so worth the trip out there. Yup. I love the stuff. 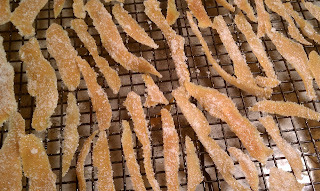 So why, I asked myself, have I never really used the candied ginger from Penzey's that I keep in my pantry, other than in Thanksgiving brine? Ginger is a warm flavor, so it goes perfectly with the other warm spices that we use at this time of year. In fact, most pumpkin pie recipes use powdered ginger. And what about gingerbread? So I kept thinking, and it seems to me that ginger would work well with cranberries and apples. I decided to add some candied ginger to the cranberry sauce. And maybe the apple pie. I haven't quite decided if I am ready to mess with the Thanksgiving apple pie. Of course, this is all experimental. And when I am doing something experimental, I don't want to blow a load of money on it. 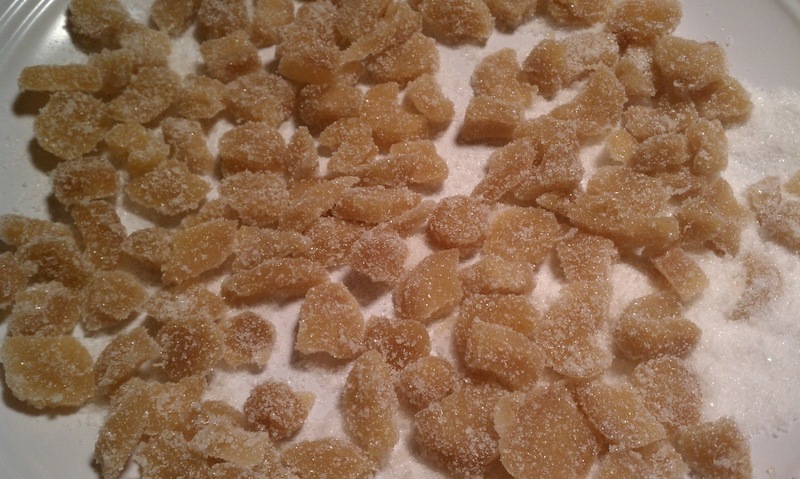 And candied ginger isn't exactly cheap. 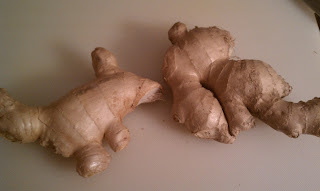 Ginger root, however is quite cheap. So is sugar. And water is nearly free. And guess what? 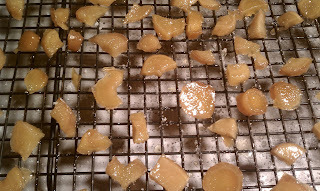 That's all you need to make your own candied ginger. I have to tell you, this is nothing but fun. I still don't see myself chewing on candied ginger as though it's a Sour Patch Kid (unless I had an upset stomach--ginger is supposed to be good for that). But I do see myself tossing a few pieces into many different dishes over the next few months. So let's get started. First, this is ginger root. It's quite unattractive. But that doesn't matter. It's fantastic. By the way, I have read that if you can get young ginger (some Asian markets apparently sell it), it makes better candied ginger. 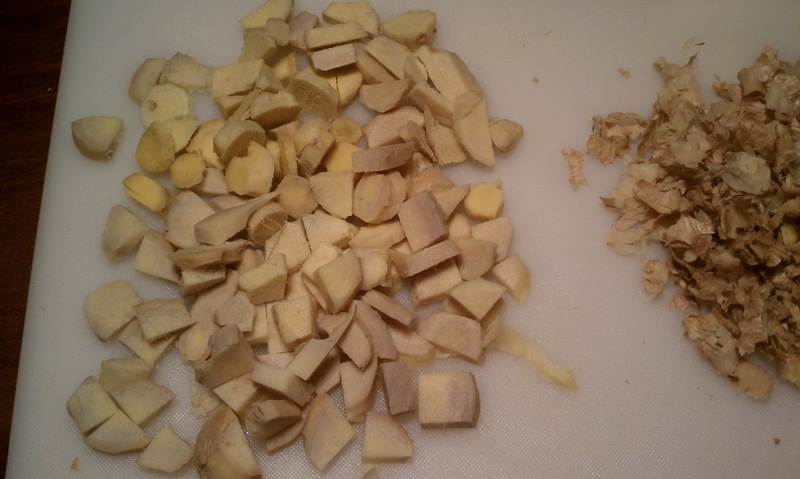 Ginger has these tough, long fibers in it, and apparently young ginger is less fibrous. But I just had the regular stuff, and it worked out just fine. 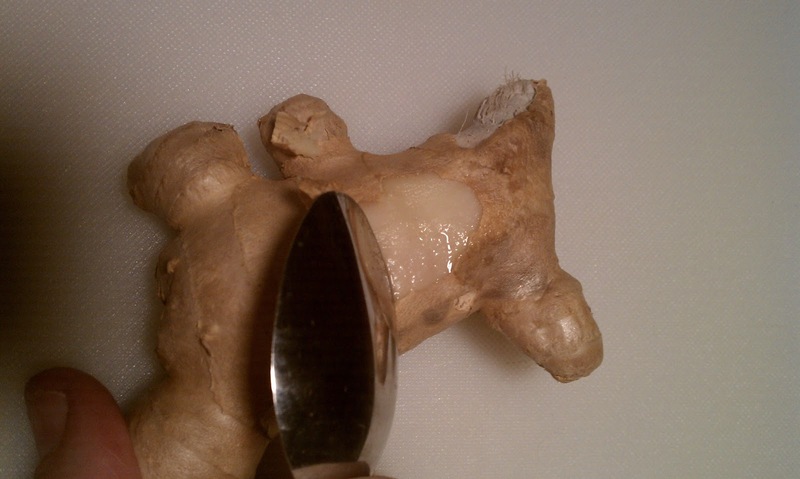 You have to get the peel off of ginger, but it's really easy. Use the side of a regular table spoon--the kind that you stir your coffee with. 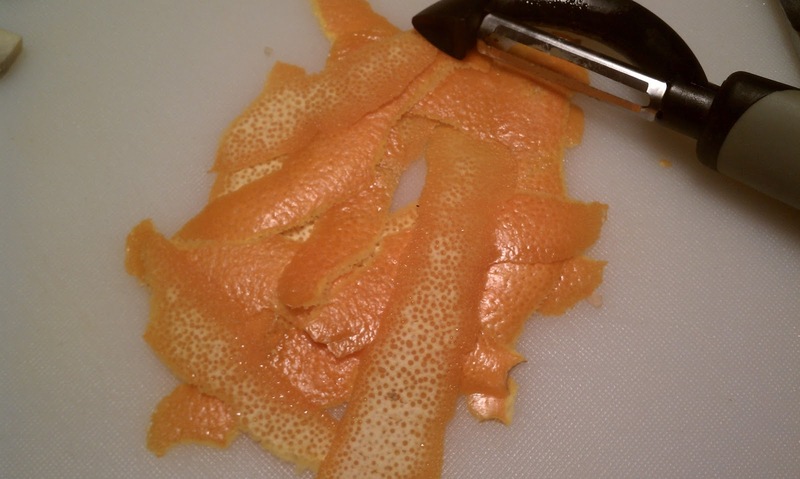 The peel scrapes right off, and the spoon seems to get into the knobs and crevasses more easily than a vegetable peeler or knife would do. 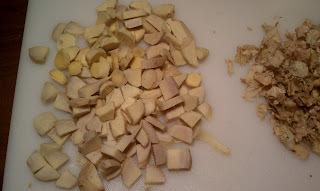 Of course, you will have some dried out ends where a piece of ginger had been broken off of the piece that you bought. Just slice those off with a paring knife. And that's what is left. The naked ginger on the left, and the pile of skin on the right. Now you just have to decide how you want to prepare it. You can slice it thinly and just have some coin-shaped pieces. I decided to mimic the stuff that I bought at Penzey's, so I sliced it a little more thickly, and then cut those pieces into two to four smaller pieces, ending up with chunks. You just have to make sure that the pieces are not so small that they will fall through your drying rack (aka cooling rack). I decided that, if I am candying ginger, I might as well candy something else. I had these pretty oranges around for the cranberry sauce, so I figured I might as well get my money's worth and candy the peel. I think that the vegetable peeler works best for this. I tried the thick part of the little zester that I have, but it dug deeply into the pith--the white part between the zest and the flesh. The pith is bitter, and pretty much good for nothing, so I knew I wouldn't want it, and I didn't want to deal with trimming it by hand. 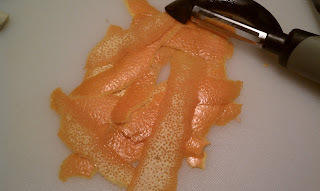 The peeler just shaved the strips of zest off, with only a trace of the pith left. I wasn't worried about that little bit. 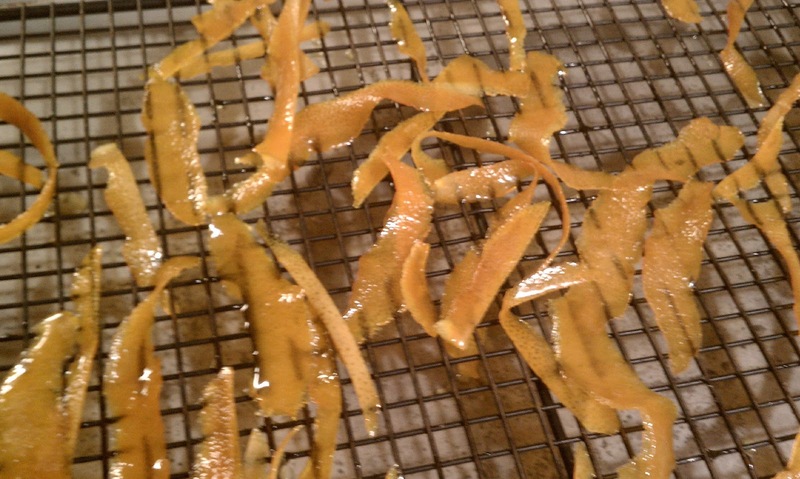 I was picturing thin, maybe even curly little strips of candied orange peel, so I sliced some of the strips in half, lengthwise. I wouldn't do that again. They don't curl up, they don't look particularly more interesting, and they are harder to work with. You can always cut the finished product up any way you want, but the original strips are easier to work with. Once the ginger and orange peel are prepped, it's time to make a simple syrup. Simple syrup is just sugar and water. The ratio will depend on what you are using it for. If you want a syrup to flavor coffee, tea or lemonade, probably equal parts water and sugar. If you want the syrup to be thicker, use more sugar. Here, I used equal parts. 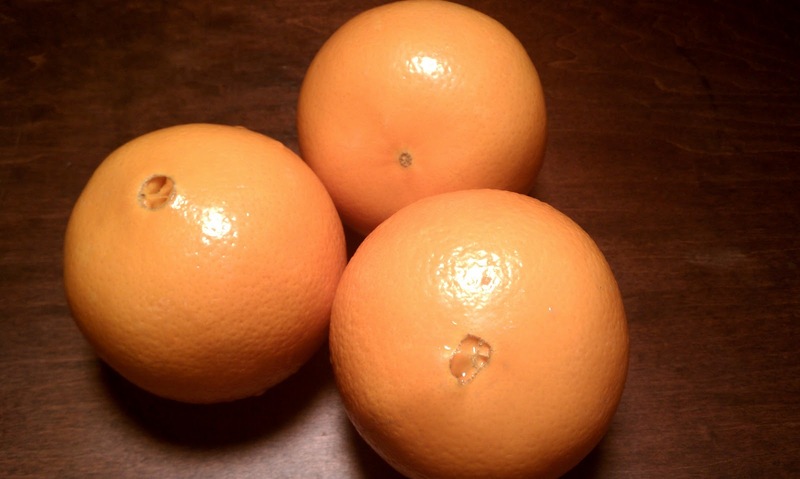 For three oranges, I used a cup each of sugar and water. For the ginger, I used two cups of each. Just pour the sugar in, then pour the water over it. No need to stir at this point. Place it on the stove and turn it on medium heat. 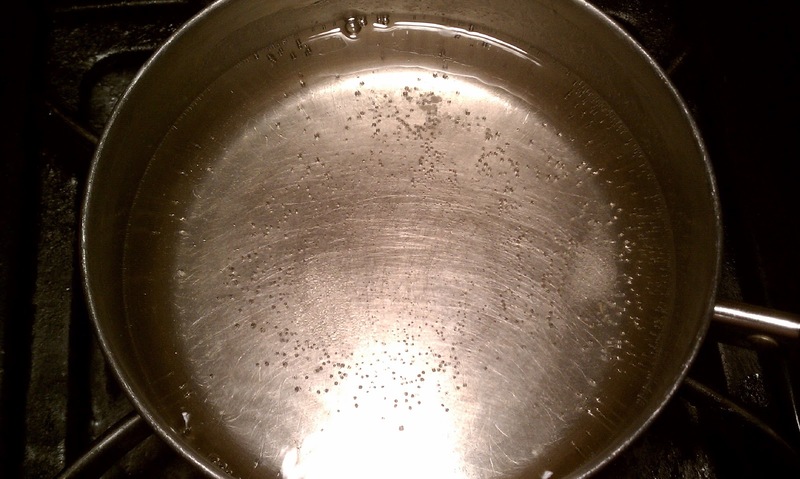 After it looks like it is getting warm, just use a stainless or silicone utensil to gently stir the sugar. Don't use a rubber spatula! This stuff gets hot, and rubber will melt. Silicone spatulas, however, are heat-resistant and work great. Don't walk away from this! 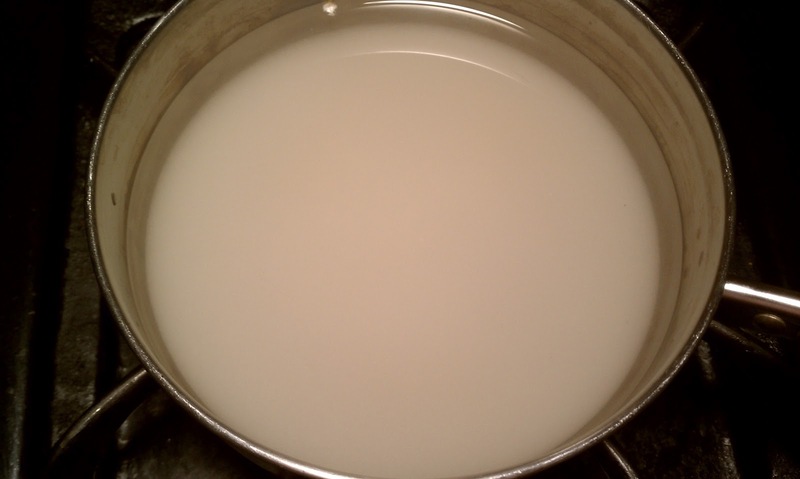 It doesn't take long for the sugar to melt, and the syrup will begin to simmer. It's a big mess if this boils over (not that I have any personal experience, mind you), and it can happen quickly. So stay close to the stove. 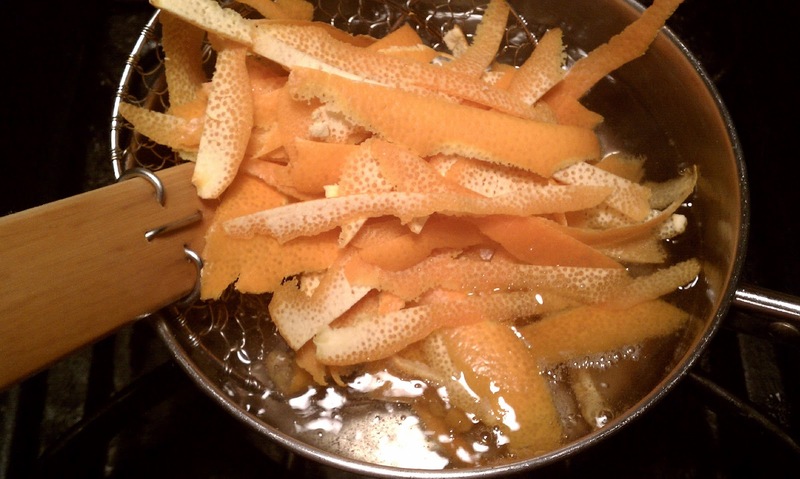 Once the syrup is at a simmer, it's time to add the ginger and orange peel. I almost dropped the ginger in, straight from my hands. But then I remembered how hot that syrup is, and how I really didn't want that sticky liquid to splatter up on my hands. So I grabbed my trusty spider, filled it up, and gently slid the ginger into the syrup. Accident averted. If you don't have a spider, I would highly recommend that you get one. It is cheap and very useful. I use it when making pasta dishes that have blanched vegetables in them. I can blanch the veggies, fish them out with the spider, and reuse the water for the pasta. 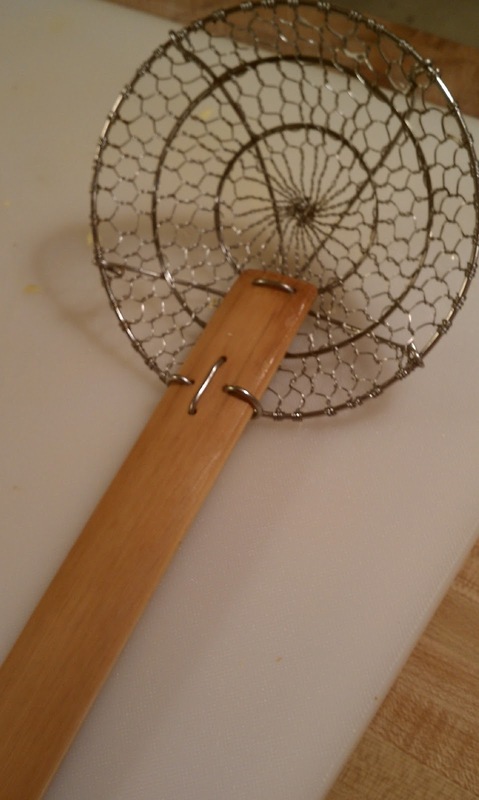 I often use the spider to scoop larger pieces of pasta out of water and into sauce, without having to get a colander dirty. 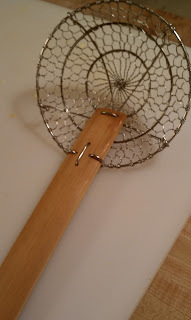 And on the rare occasion that I deep fry anything, the spider is perfect for lifting the finished product out, draining over the pot, and keeping the mess to a minimum. The ginger will need to cook longer than the orange peel. 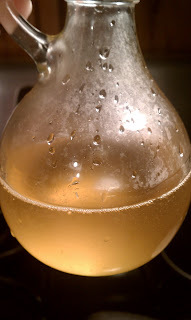 My peel cooked on medium heat, at a vigorous simmer, for about 40 minutes before it looked translucent. So I worked on draining it while the ginger finished cooking. I used a fork to grab each piece of peel from the syrup and lay it out on a rack set over a sheet pan. It's not super fussy, but you will want to keep them as separate as possible. By the time that I had all of the pieces on the rack, it was cool enough to toss in sugar. Just put a little sugar on a dinner plate, and lay several pieces of peel on top of it. Press down lightly, and then turn them over and press again. 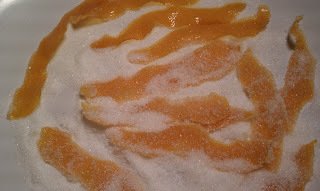 Then just toss them around a bit to adhere the sugar all over. Then move the pieces back to the rack, and sugar another batch. Leave them to dry until the ginger is ready. Finally, once the ginger is done cooking (because there's no need to dirty a second rack! ), the orange peel will be cool and dry enough to place in a ziploc bag and refrigerate. I did try a piece, and it tasted good. But I can't help but think that it would taste even better with some melted bittersweet chocolate drizzled over it all willy-nilly. And I will probably throw some into almond scented muffins and cookies with some Craisins. I might try mincing some up and tossing it into a salad, too. Hmmm...possibilities. 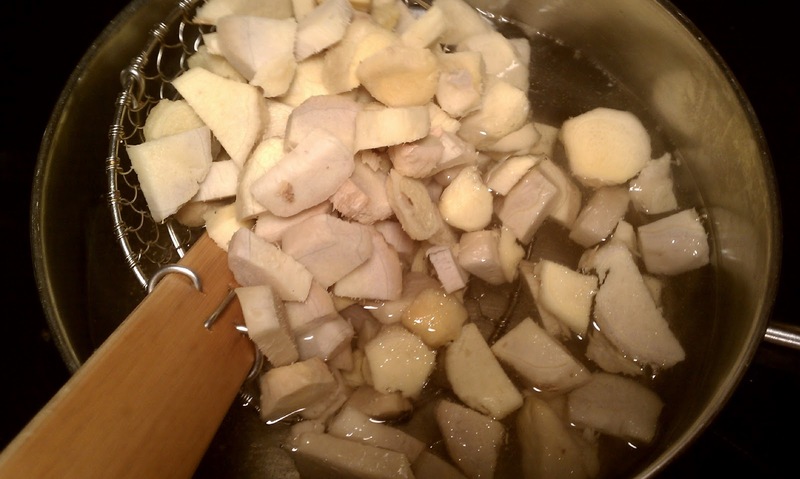 I cooked the ginger for probably an hour and 15 minutes, or until it was tender. Just drain the ginger the same way that you drained the peel. Again, try to keep each piece separate. It is coated with sticky syrup, and you don't want the pieces to glue themselves together. 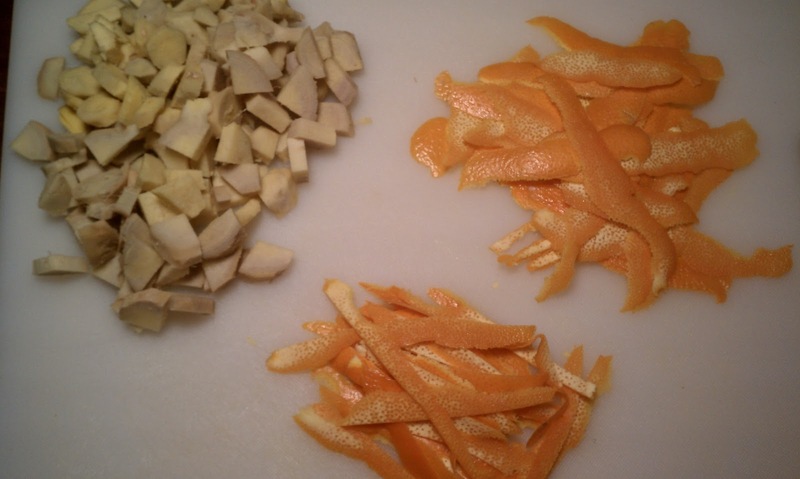 Let the ginger dry and cool a little longer than the orange peel. About 15 minutes should do it. 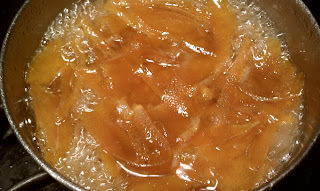 Then coat the ginger with sugar just like you did with the peel. And that's it! 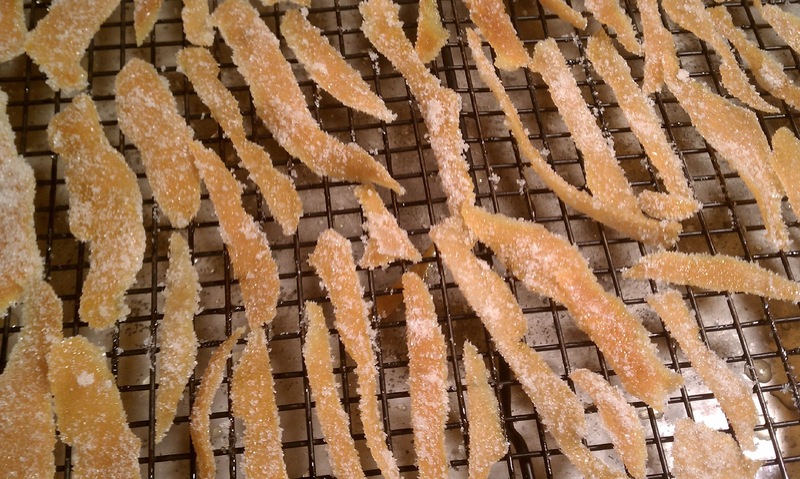 You now have candied ginger. Lots and lots cheaper than buying it, ready made at the store. Except.....that's not quite it. 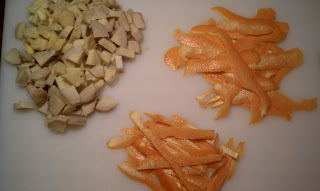 You see, there is a beautiful side benefit of candying ginger and orange peel. Remember that simple syrup? You just infused it with orange zest and ginger. That could be really good in hot or iced tea, or brushed over a piece of angel food cake. So don't waste it! This is the orange simple syrup. 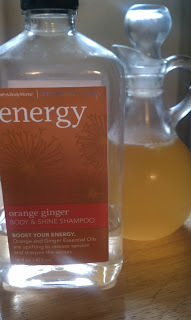 I was thinking about how nice that would be in a hot cup of tea or apple cider, and then thought about the ginger syrup, and eventually, I thought of the words "orange" and "ginger" close enough together to have a revelation of sorts. I love orange and ginger together! At least, they smell amazing. Best shampoo in the world. It makes me happy every morning. So I decided to add some of the ginger syrup to the orange syrup and have a nice mix. It will still be good in tea, and if Bath & Body Works is to be believed, drinking it should give me a boost of energy every morning. Yeah, I know....wishful thinking. But it still tastes and smells amazing! Enjoy! I am inspired! Definitely going to give this a try, especially for my turkey brine next Thanksgiving! Thanks for posting. It looks easy enough for me to do it without too many problems. :) Happy Thanksgiving!